BRG Group, a leader in finance, banking and golf resorts, officially opened Vietnam’s first Nicklaus Design golf course in August, with the christening of BRG Legend Hill Golf Resort, an 18-hole layout located in Phu Linh, Soc Son, Hanoi, Vietnam. As the first Nicklaus Design course in the burgeoning market of Vietnam, BRG Legend Hill Golf Resort brings the world’s leading golf course design firm to close to 400 golf courses spread across 41 countries. BRG Legend Hill Golf Resort is also the first golf course in Vietnam to adopt a unique “twin green” design concept, a first for Nicklaus Design not only in Vietnam but in Asia. The 36 different greens within one 18-hole golf course create an almost endless variety of hole combinations that can be matched to a golfer’s playing ability and/or provide guests a different golf experience with each round played. The additional greens added an interesting design challenge for the Nicklaus Design team, and now finished, will ultimately offer a distinctive and memorable experience for golfers. Southeast Asia, and in particular Vietnam, has become an important and vibrant market for Nicklaus Design. The firm currently has five courses under development in Vietnam, as well as one in Cambodia and another in Indonesia. In addition, it is expected that there will be four Jack Nicklaus Academies opening up in Vietnam over the next four years. Nicklaus Design currently has 45 courses in some form of development in 20 different countries. 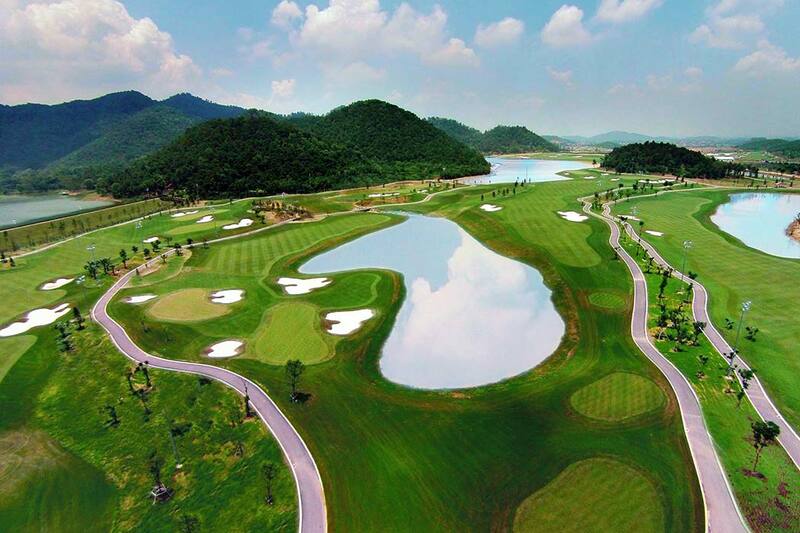 “The launch of this new golf course is the realization of a vision to offer golfers a unique and world-class facility and I am proud to declare that the original vision has been realized and in many ways, it has exceeded all of our expectations,” said Madame Nguyen Thi Nga, chairman of BRG Group. BRG Legend Hill Golf Resort is the golf jewel in the BRG Group crown—a rare gem for passionate players brought to life by engaging the world’s leading industry names, including: Nicklaus Design, the United States-based firm founded by golf icon Jack Nicklaus; Flagstick project management (USA); Z Design (USA) clubhouse architecture and interiors; GCH (USA) landscaping; Rock Group (USA) water features; PSI (USA) irrigation systems; and an international team of PGA and GCSA experts to manage and operate the golf course and clubhouse. Collectively, they have produced an irresistible new course for golfers in the region. The course is located in the foothills of a legendary property in the Soc Song District, adjacent to the Soc Temple, which was made famous by Phu Dong Thien Vuong (The heaven-sent king of Phu Dong Village), better known as Thanh Giong (“Saint” Giong). As a mark of respect for one of the “Four Vietnamese Immortals,” the new golf course was named “Legend Hill.” BRG felt that only a course created by Nicklaus Design could reflect Saint Giong’s legacy and create a world-class golf experience of the highest standards. BRG Legend Hill Golf Course now reflects a new high standard in golf by offering an attraction for players of all levels to enjoy. The launch of Legend Hill also heralds a “strategic alliance” between the BRG Group and Nicklaus Design that will see the development of business initiatives that will go well beyond golf course design. It is expected to cover a wide range of other business opportunities that will be focused on developing Vietnam into a truly world-class venue for quality golf and to also help develop the country into a major force in international golf. As an extension of the relationship, the Jack Nicklaus Academy of Golf will open its first school in Vietnam at Legend Hill. The Nicklaus Academy promises to be one of the most complete golf instruction and training facilities in the world, combining the latest technology with the playing philosophy of Jack Nicklaus. It will offer a wide range of programs, including specialized instruction, one, two or three-day golf experiences, corporate programs, personalized packages, and ladies, children’s and family lessons. Madame Nguyen Thi Nga, chairwoman of BRG Group, speaks at the opening of BRG Legend Hill Golf Resort.